During a recent visit with my in-laws down in Southern Virginia, we drove out to Poplar Forest, Thomas Jefferson’s retreat home. Built as a perfect, single-story octagon with four elongated octagons set around an almost-perfect cube, Jefferson designed this architectural and engineering masterpiece to be his getaway from the hubbub of public life. Most of us in America are familiar with this passage from the Declaration of Independence – having heard it so many times in our grade-school social studies classes. What we aren’t as familiar with is why Jefferson thought that these truths were “self-evident” and where they came from in the first place. A ‘self-evident’ truth is a truth that proves itself without need of further validation. In other words, it’s so obviously true only a fool or someone who’s willfully ignorant would contest it. And as far as America’s premiere expression of enlightened thinking is concerned, our equality is not just true; it’s so true as to be ‘self-evident’. However, all varieties of objective measurement clearly demonstrate that we are not equal: some people are faster than others; some are stronger than others, some are more attractive, more artistic, better at making money, better at math, better at cooking or flower arranging and so on. The world is awash with contests and comparisons large and small that clearly demonstrate to even the most casual observer that inequality is a self-evident truth. So how is it that America’s founding fathers thought otherwise? It’s because the equality to which Jefferson and the other authors refer is spiritual, not material. They’re talking about a metaphysical equality; equality that’s not based on physical attributes or social constructs. This metaphysical equality is the philosophical foundation of the Declaration to which America’s founding fathers pledged their lives, fortunes, and sacred honor. At first read, one may wonder if this be presents a conflict between church and State. As evidenced by the First Amendment, it doesn’t. While Jefferson and many of the other Founding Fathers believed in a Divine Being, they were not Christians in the way that the word has come to mean in contemporary American politics. Rather, Jefferson and his colleagues simply recognized that for any discussion of “rights” to make philosophical sense, they must be based on the metaphysical conception of spiritual equality rather than anything in the physical world. Rights that are divinely bestowed are also ’inalienable’, which means that no human agency can infringe on them; they are intrinsic to our very being. Of course, it’s all too evident today that Jefferson and the other Founding Fathers neglected to extend those self-evident rights to a significant part of their fledgling country’s population. Similarly, we can also see that no matter what lofty metaphysical truths it’s based upon, the American system of justice is failing to live up to its own ideals today. From the perspective of yoga philosophy, the root cause of this failure is forgetfulness of our shared spiritual nature. Yoga is the art and science of remembering our true spiritual nature. As such, practicing yoga is an inherently political act. In fact, it’s the most radical form of political action we can take. By “political action” I don’t mean unfurling our yoga mats on the Washington Mall and aiming a ‘Warrior Pose’ at the Capital building (however gratifying it may feel). What I mean is advocacy, service, non-cooperation, and direct action that’s in line with the values of yoga: the renunciation of gratuitous materialism, purity of thought, word and deed, kindness to all beings, and truthfulness. Truthfulness means more than pushing back against ‘fake news’ and leaders who are obviously liars; it means defending the metaphysical truth that establishes our equality and rights, it means ringing the ‘Liberation Bell’ that will wake us from the spell of spiritual forgetfulness that’s at the core of almost all of our political conflicts. Yoga doesn’t encourage us to adopt nationalist sentiments; it encourages us to engage in service to an all-inclusive Absolute Truth. The Fourth of July – America’s ‘Independence Day’ – is a secular holiday with a spiritual seed. The opportunity for realizing the American ideal of liberty and justice for all lies in watering that seed. If you liked this blog post, please share it! 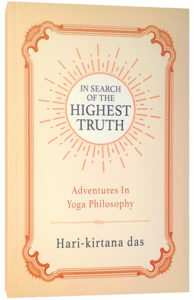 A clear and concise guide to seeing the modern world through the lens of yoga’s ancient wisdom.